Woweeeee that is exciting! I’ve been getting in the festive spirit all week, with far far far too many Christmas parties and my bank account is curled up in the corner crying her poor eyes out right now… so today is quite a chilled day! A little bit of catch up on rest is needed! 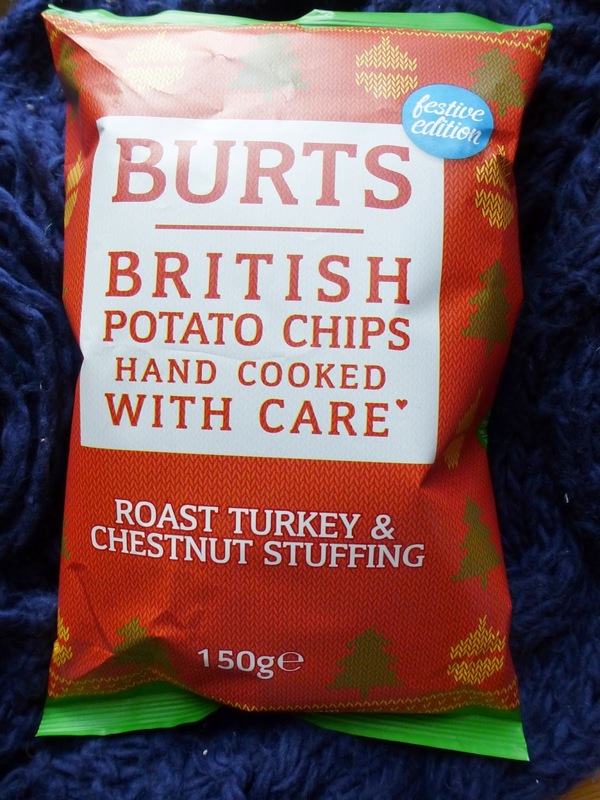 I am currently curled in bed with these Roast Turkey & Chestnut Stuffing Crisps and episode one of Suits, because the lovely Kate Allen keeps telling me I NEED to watch it! hope it’s as good as you say hun! I don’t really like ‘meaty’ crisps (except smoky bacon and chicken) but turkey and chicken are similar right…? Plus Burts crisps are so YUM, I love the sea salt ones. The packaging is also really cute and festive! Okay, so I opened them… and hmm the smell wasn’t the nicest, it wasn’t exactly like MMMMM christmas dinner. I then went to try one, I got really nervous actually! I am perhaps not the best person at trying new foods, I quite often find the foods that I avoid and then finally try are my favourites like ASPARAGUS. The taste, I didn’t really find I noticed much of the turkey, but I tasted the stuffing, so it was basically like eating stuffing flavoured crisps, so if you absolutely adore stuffing… which a lot of people love the most at Christmas Dinner, then you will probably really love these crisps! My personal favourites are either the dessert, YUM, the prawn cocktail starter, but for the main…. hmmm I like the pigs in blankets, roast potatoes and parsnips, oh and the yorkshires. Basically I love me a Christmas Dinner! They wouldn’t be my go to flavour, but it still didn’t stop me from munching my way through half the bag! But I could stop… so I guess that speaks for itself, I usually can’t stop eating crisps because they are so moreish, meaning I tend to try and avoid big bags! Let’s just say…. these crisps are kind of average, I definitely wouldn’t trade my real Christmas Dinner for them! EEK I really want a Christmas Dinner now! Is stuffing your favourite part of a Christmas Dinner? You should probably try these… What are your favourite crisps? I feel like these wouldn't be my favourite flavour of crisps – it's a shame they didn't make Pigs in Blankets flavoured ones because they would be a real hit I think! Have you tried the vegetable crisps that Tyrell's do? They're Carrot, Parsnip and Beetroot so they feel really festive to me!